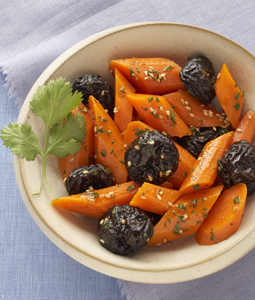 Moroccan Carrot Salad - A recipe from Savor California, the online showcase for extraordinary gourmet foods and beverages from California. Cut carrots into 1-inch pieces on diagonal. Drop carrots into boiling salted water. Cook 5 minutes after they return to the boil or until tender but not mushy. Drain. In large bowl, whisk together lemon juice, oil, paprika, cinnamon, cumin and salt. Add carrots, dried plums and cilantro. Mix together gently. Mound in serving bowl or on 6 individual plates; sprinkle with sesame seed.